I have run the Rugged Maniac New England for years now, and always have an amazing time, this race proved to be a very similar experience. 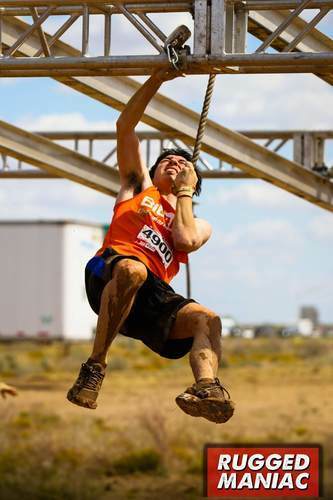 Rugged Maniac are my favorite OCR brand since they cater to the widest range in skills and abilities. They have obstacles for everyone and I have taken many OCR, running, and non-running friends alike to their races for everyone to always have a blast and want to return the next year! They upgraded to nice tech t-shirts this year. You also get a medal and really nice free race photos as always! Aid stations were at every mile and had plenty of water. The scenery was just desert, but you don't really run OCR for the scenery anyway. They had a stage with live interactive entertainment going on. They also had a good amount of food and drinks being sold. They had a mechanical bull, which I tried! Elevation was pretty easy, but they did add some in so it wasn't just flat desert which was nice! Parking was really easy since it was at a motocross venue. The only thing was it got a bit crazy leaving if you had a heat toward the end of the event. The Rugged Maniac's race management is one of my absolute favorites. They put on amazing races and are always kind and helpful when you need. I was late for my heat (by my own fault) and the changed my time quickly with no questions ask, at no cost. 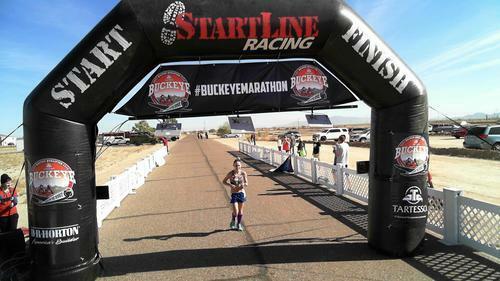 "A Race Through the Desert"
This was a really cool race that I would like to do again someday! They give you a really nice technical tee, a little backpack, chap-stick, a finishers medal, and free race photos. The aid stations start out every two miles on the mark, but increase to every single mile at some point after the half (thank goodness). The course starts around a housing development in the middle of the desert and at about mile 5 spits you out onto the longest, straightest stretch of highway through the middle of the desert. I honestly felt like I was in a Road Runner and Coyote cartoon. It was really cool running down the seemingly infinite stretch of straight, flat highway, past tons of cacti and tumble weeds toward the mountains & plateaus in the distance. Not only was the course incredibly straight, but it was also really, really flat. The course elevation map shows it's almost all slightly downhill, but I honestly don't remember any significant hills up or down. The race was run really well. They had the big flag markers at every mile, a clock at the half, and ample signage anywhere there was actually a turn to be made (not often, but still important so no one would be getting lost in the desert). My only "problem" with this race was it was in Arizona so while it is December and doesn't actually get too hot temperature wise, the dry heat and sun beating down on you at all times made it seem so much hotter. I was so glad for the aid stations upping to every mile because I felt like the water was evaporating from my throat as I drank it. I don't usually drink much during races, but I stopped at every single of the last aid station, sometimes taking two waters. I would definitely still recommend this race and just say be prepared for the heat! "An Awesome Race and Event Overall!" I really enjoyed this race and event! For swag you get a really nice long sleeve tech shirt and an adorable Reebok scrunchie! You also get A TON of race photos, but you have to pay for them. The aid stations were just hydration, but I think that is kind of to be expected for a shorter race. They were definitely frequent enough and filled with awesome volunteers! The scenery was through the cool Boston architecture and along/over the water! It was really cool to see all these women literally take over the streets of Boston! The expo was AWESOME! They had meditation, two yoga, and two cardio sessions to warm you up and then post-race yoga to cool you down. They also had plenty of brands selling goodies. It felt like a really flat course to me. I would recommend getting driven there. They were up front with us and said the parking garage for the commons would be closed and street parking in Boston can be rough. I still gave it a good rating though because I was able to easily have a Lyft drop me off and pick me up directly from the commons without issue so access was still really good. I feel like the race management put on an excellent race! They were able to have the streets we ran on completely closed off so it was nice and safe to run through the city. They also had clocks at every mile. The start had marked off time groups so there was no guessing and it wasn't a free for all. The packet pick up the day before was extremely easy and well done. 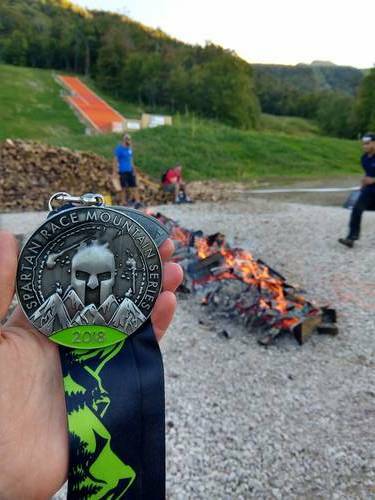 I ran the Spartan Beast at Killington (the 12+ mile distance). It was INSANELY fun and challenging!! As with all Spartans you get the tech tee, finisher's medal (this one says mountain series! ), and awesome free race photos! There was plenty of aid stations so I didn't bring my full out hydration pack. I had just a carry-able bottle since some stations were cup-less. I don't remember what stations had for food, but I would bring your own just to be safe. The scenery on top of the mountain is so pretty!! Also a decent amount of the course is through pretty woods! It is up a mountain so the elevation is pretty intense. Though I think the hardest parts were the start (gotta send you up the steepest hill to intimidate you!) and then of course the Death March, which was straight from the bottom to Killington peak right under the gondolas. Parking was really easy, they used the ski resort lots. We got there later and had to be shuttled but it was a really quick ride. Race management put on an EXCELLENT race as always! There is a swim section, but they make you were life jackets so you can literally just float. 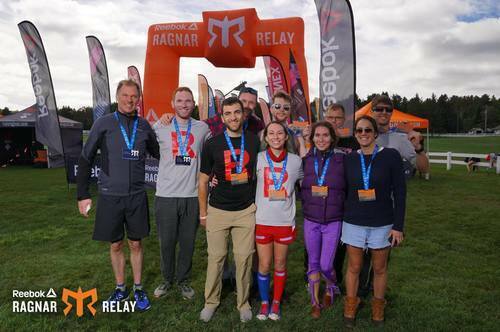 This was my third Ragnar Relay and I had an amazing time! As usual you get a nice t-shirt, the cool team puzzle finishers medals, tattoos, and stickers! The aid stations were like a normal Ragnar race, where there are some on what are considered the hardest and longest legs. None of my team had any issue with their placement. I think some people brought handhelds though. The scenery was very pretty during most of the race! We went though multiple wooded areas and by multiple water sources! I count the after party as the expo. I was really happy with this after party. They had much more substantial food options this time, two choices of wraps, AND they even had both types in a gluten free version! It was decently rolling hills. I want to say during the middle was the most uphill, which I missed out on due to lightening. It was a bummer my middle leg got cancelled, but also I can understand their need for safety and they did say we could run other runners legs with them to make up for it. I counted parking as the ability for vans to maneuver/pull over to cheer on runners. The roads were fine and were plenty of opportunities to pull over along the course. Race management did an excellent job of providing a really fun course and race!